It used to be, many years ago, that we would call South Africa’s national telephone company, Telkom, ‘Public Enemy No 1’. (They were a monopoly, and their services were mediocre at best). Well, these days that title belongs to South Africa’s electrical utility company, Eskom. 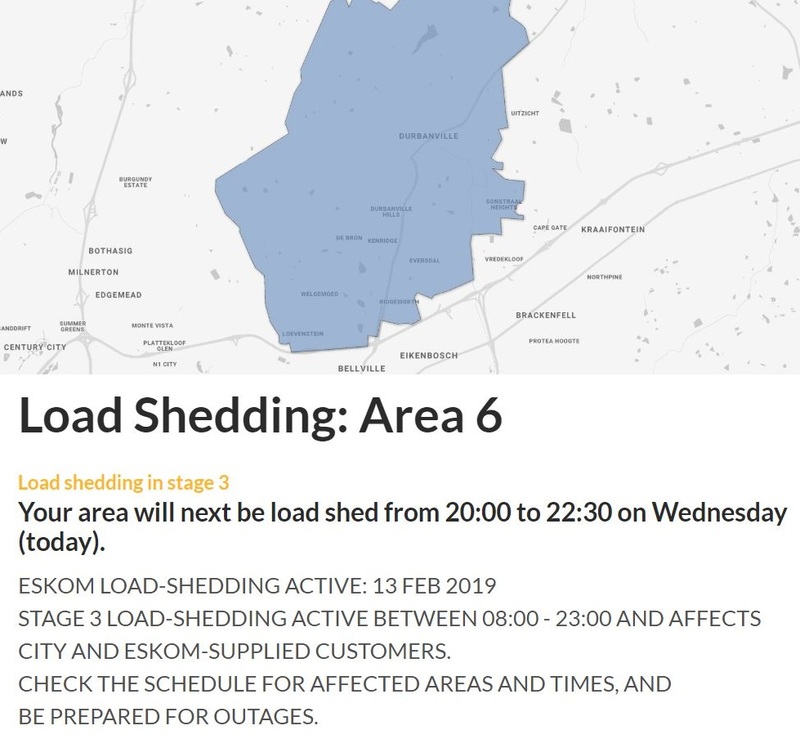 On Sunday, unexpectedly, the utility announced that it had to resort to Stage 3 Load Shedding mode, with widespread power outages. There were more on Monday, on Tuesday, and today. For Stage 3, Eskom implements rolling blackouts per published time periods and areas around the country, that forces a cut in the national power consumption by 3,000 MW. (About 10%. 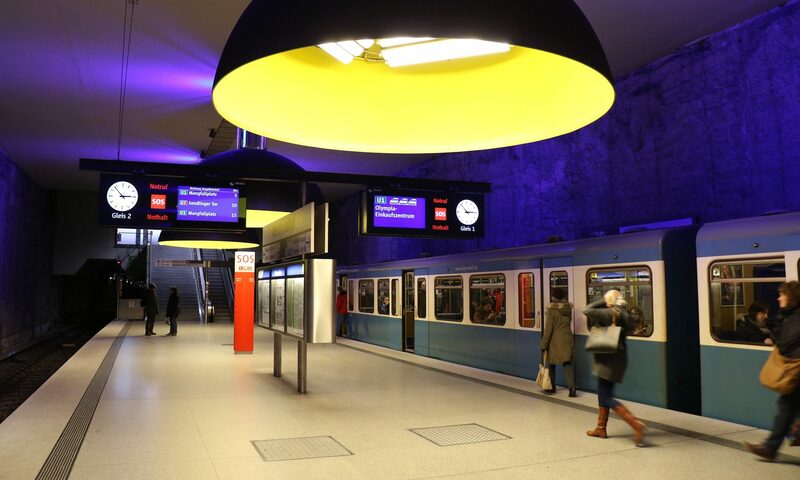 The country’s power consumption needs at this time of year is around 30, 000 MW). It now appears that there are major problems with the start-ups of the two brand-new power stations called Medupi (dry-cooled, coal-fired, 6x 800 MW) and Kusile (coal-fired, 6x 800 MW) , and that the utility was not forthcoming about it. A team of Italian engineers (power supply & power grid experts) has been called upon to come and help devise strategies to get Eskom’s operations to a better place. They cannot come soon enough .. even though I am sure we have South African engineers that are completely up to the task, if only they were given the opportunity by Eskom’s senior management. 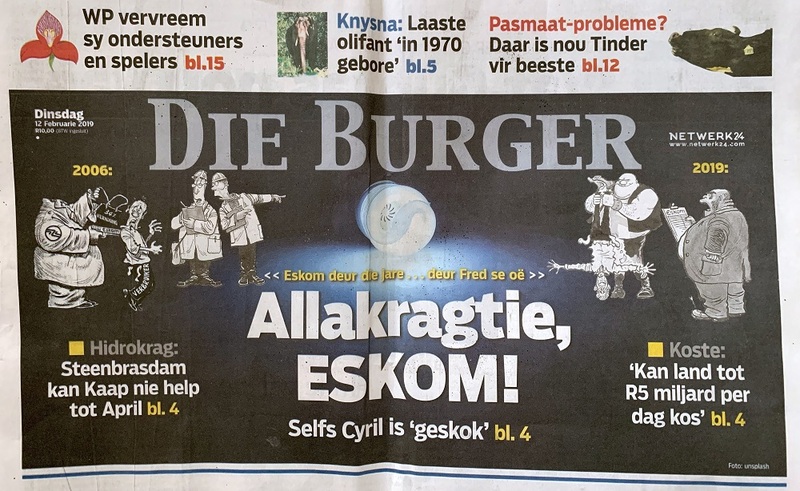 Front page of Die Burger (‘The Citizen’) newspaper from Tuesday: ‘What the Hell, Eskom!’ .. and ‘Steenbras Dam cannot help until April’ (to generate hydroelectric power) | ‘Even Cyril (Ramaphosa, President), is shocked’ | ‘Could cost the country up to R5 billion (US$ 357 million) per day’ (per the Organisation Undoing Tax Abuse). Here’s an online notice of the outage that happened tonight in my area. These power outages hit large and small businesses particularly hard, of course.